Just recently, while fly fishing on Bass Lake in the West Dugger Unit of The Greene-Sullivan State Forest I caught and landed a 40 inch Musky. 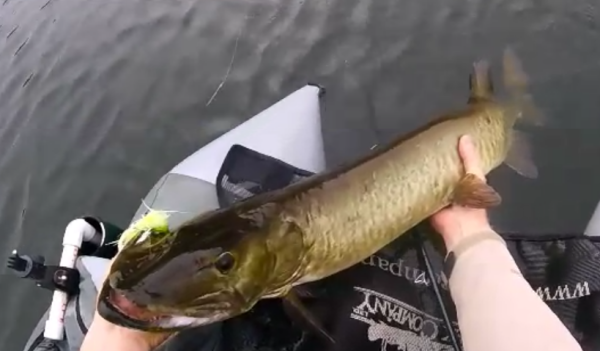 Now here in southern Indiana a 40 incher is pretty good and for me it was probably my 10th musky from Bass Lake…and while I had lost two at different times that were as big or possibly bigger…this was the first time I had actually hooked and landed a big toothy fish. To do it in my float tube was pretty special as well due to the fact that I was in the water and up close and personal with the fish…and all of his teeth. 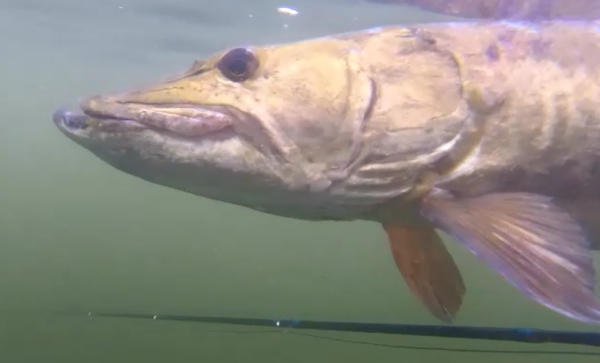 As you can see from watching the video, I was using my 10 weight rod and frankly I was glad that I had my big rod as this bruiser really put a bend and a pull on my system. The fly was a light green fly that I had tied a couple of years earlier; in fact they don’t call this lake bass lake for nothing and it is my opinion that the big fish are focusing on and eating the many bass in the lake. This light green fly is readily visible and from a distance looks much like the flash you would get while fishing for bass as they slash at and strike at your fly. It was my biggest musky; all I can hope for now is a 50 incher. Nice catch! I’ve been wanting to catch a Muskie. Need to fish there sometime.